When the weather starts to get nicer, I naturally start to gravitate towards bright, fresh foods and away from heavy, bulky foods. I think everyone does right? I'm not so sure that this is just because more fresh vegetables and fruits are coming into season. I think it really has to do with me wanting to pretend like winter is over. When I drink a bright, fruity smoothie, I can easily pretend like I am sitting on the beach somewhere, digging my toes into the sand with the sun on my face. When I eat chicken noodle soup, it's harder to make that dream feel realistic. Drinking smoothies with vegetables in them makes me think for a second that I might actually be able to successfully complete a juice cleanse. Then I remember that I like bread too much. But for a second, the thought is there! If you're turned off by a smoothie that has a carrot in it, please don't be. 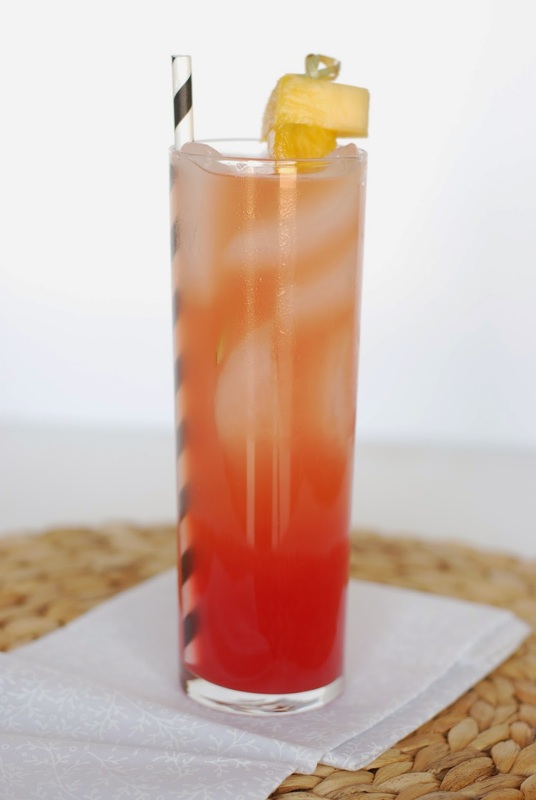 It is still sweet and fruity from the pineapple and you'll look really trendy sipping on it after your hot yoga class. Trust me on this one. A few years ago, my mom starting making family cookbooks. She collected recipes mostly from my grandma and my aunts, maybe a couple from my cousins and sisters. I must not have been asked to contribute, because none of the recipes have my name at the bottom of the page. Even though I wasn't invited to the club, it's still one of my favorite cookbooks. I know that every recipe in there will turn out the way it's supposed to and it will taste just like I remember it. There are no surprises. No letdowns or disappointments. No matter how good a cookbook is, it will never be quite perfect like one that you make yourself. I started making my own back when I was in middle school, slowly accumulating more and more tried-and-true recipes, and now when I need something for dinner or to bring to a friend's house, I will almost exclusively turn to one of these 2 books. This apple pie recipe has no frills. It's not particularly innovative. That being said, it's exactly what you want in a classic apple pie. Of course, so much depends on the quality and flavor of the apples so, like any apple pie, it's more of an art than a science - adjust the sugar and lemon juice to get the right balance of sweet to tart. Maybe it's because we were never allowed to have bright, food-coloring-loaded foods as kids, but I am not a fan of red velvet cake. I can pretty much guarantee you that I will never purchase a cake or cupcake that's chocolate flavored but somehow red colored. Especially not with cream cheese frosting. It might be one of the very few desserts I would flat out refuse. However, Austin really likes it. And in an effort to be nice, I made him some red velvet pancakes for Valentine's Day this year. See, I can be nice. To my surprise, they were actually really good. Granted, I left out about 2/3 of the red food dye, but you can make them the way you like. You know how your facebook feed seems to go through phases. Like, at one point all your friends will be getting married; then, they get puppies; then, they have kids...and you get to see the whole process? Well, I seem to be in the baby part of that timeline. Everyone must think I want to know about their stomach's growth progress and their nicknames for their unborn children. And before you say anything (Mom), I know that all I post about is Dingo and yes, I am a hypocrite and if I ever have kids, I'm sure I'll do all the things I'm annoyed by. So anyway, as an apology for offending all of my facebook friends, here's some stereotypical pregnant woman cravings! And even better, they're fried! Still friends? Great. After spending a long weekend out of town, eating out (mostly hamburgers), when we got home Sunday night, I was ready for some "real food." My body can only take so much grease and then it really starts to crave something that's not cooked on a grill or in a fryer. It makes me wonder how people eat out every day. It really makes me wonder how people eat fast food so often. I'm not trying to claim that this casserole is super healthy, just that it's got some nutrients and that it tastes better than a Beef 'N Cheddar. I pretty much love anything that has water chestnuts in it. They are so perfectly crunchy and they don't have a lot of flavor, so there's really not much to dislike. Add in some hamburger, rice and seasonings and you've got an easy dinner. March 10 | Work birthday party for my mom! March 3 | My favorite type of 'cloudy' days. Lately, I've been thinking a lot about what society deems acceptable. Mostly in terms of drinking. Maybe this is just because I've moved back to Utah - a state notorious for it's whacky liquor laws - but really, everywhere has arbitrary rules about what's allowable and what's not. Like, why is it ok to drink a beer in the middle of the day if you're on the mountain skiing but not at you kitchen table? Unless it's a holiday, then it's ok. And why can you drink vodka in the morning or champagne but not beer or wine? What's so magical about 5 o'clock? 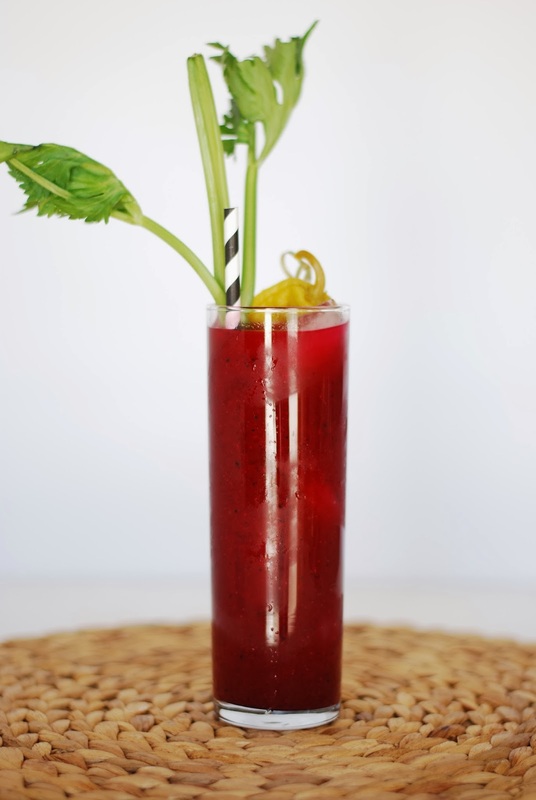 I may not understand the reasoning behind it, but I do know that you can drink a beet bloody mary in the morning or early afternoon with brunch. You can even have a few if you want! If you like the flavor of fresh beets, this is for you! It still has the signature tomato juice to it, but it's much more muted in combination with the beets. Adjust the amounts of other ingredients as much as you like to make it spicier or milder and drink up! Most of our stuff is in storage (in my parent's garage) right now which does two things. First, it makes you realize how much stuff you have that you don't really need. And second, it makes you realize the stuff that you have that you really like. For me, everything that fits into the second category is in a box marked kitchen. I want the Kitchenaid, the Ninja blender, and the cast iron skillet back. I didn't have a cast iron skillet for a long time, mostly because I didn't understand how to "condition" it, but after we got one, it became one of our favorite pans. Kind of like that song, "If I had a Hammer" by Peter Paul and Mary. "If I had a hammer, I'd hammer all over this land..."
Well, if my skillet wasn't packed away, I would cook everything in it! I would cook in my skillet in the morning. I would cook in the evening. I would cook cornbread, and dutchbabies, and pork chops! I've been rock climbing for about 8 years now. Sometimes I'm really good about getting to the gym (or outside) 3 or 4 times a week. Other times, it might be months between visits, but for the most part, it's been 8 years. This morning, I went to the gym for a quick hour of bouldering before work by myself and I don't think I've ever gotten that tired and worn out from climbing so quickly. Usually, working out with other people pushes you harder. You have more motivation to keep going. Not the case in this particular situation. What I found out is that when you climb alone, you have no one to talk to. There's no reason to rest, because you feel like an idiot sitting alone on the pads. Long story short, my hands and arms are tired. Lucky for me, my friend sent me this recipe for no-knead bread! It takes a lot of time, but it's almost all downtime. Basically, mix together the ingredients tonight before bed and tomorrow for dinner you could be eating fresh baked, perfectly risen, golden brown-crusted bread! p.s. This is definitely the type of recipe that you'll want to read all the way through first so you know what's coming (made that mistake!). February 24 | Our half marathon is less than 2 weeks away!